Make sure you live when you are still alive! Someone I know told me recently that he found it very difficult to “give up” worldly Life. And so, he concluded, he would never be able to lead his Life with detachment or be able to let go! I politely reminded him that there really is no need to “give up” anything in order to live! I invited him to understand the true essence of spirituality before he came to his conclusions! Here’s what (I have learned from Life and) what I shared with him. Spirituality is the flowering of inner awareness. It is the realization that at the end of this lifetime, nothing, not even your experience through this Life that you are living right now, will matter. And through this realization, what is also known as enlightenment, or bliss, you learn to be happy with what you have and lead a Life of contentment and inner peace. Over time, through continuous practice, you cultivate an attitude of detachment. As your awareness grows, so does your ability to live fully, in a “let go” mode! To be sure, a person who is spiritual, or enlightened, need not abdicate anything. She or he can continue to live in this world, surrounded by all things material, and yet, as the Bhagavad Gita recommends, be above it. As one Zen Master taught his disciples, who wanted to know what enlightenment was: “It is not at all complicated. It only means when hungry, eat. And when tired, sleep!” Most of the time, we complicate our lives by making choices that are clearly avoidable! And then we complain that our lives are meaningless, are not getting us anywhere and that we are unhappy! Being enlightened does not mean you are more knowledgeable or holier or that you have all the answers. It only means you are more aware – that, often times, in Life, there are no answers. That you simply live the Life that you have been given! Here’s another Zen story to illustrate this point. The Emperor asked Master Gudo, a renowned Zen Master of his time. “How should I know?” replied Gudo. “Because you are a Master,” answered the Emperor. Spirituality clearly is no rocket science. We believe it is because we are trapped in our own small worlds – bogged down by worry, fear, anxiety, grief, anger, hatred and jealousy – and are so caught up in the worldly cycle of earning-a-living, that we have stopped living! Step out and break free from whatever is limiting you. Go live your Life the way you want to. Remember: we live only once – as far as we can believe. 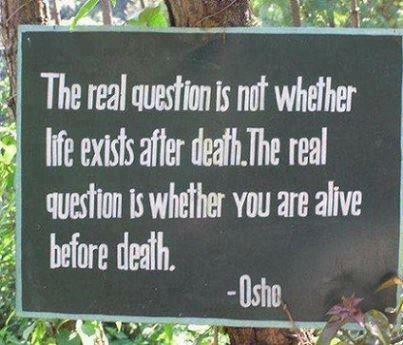 Make sure you live when you are still alive! Author AVIS ViswanathanPosted on September 8, 2013 March 14, 2016 Categories Acceptance, Awareness, Being Alive, Detachment, http://schemas.google.com/blogger/2008/kind#post, Inner Peace, Intelligent Living, Let Go, Live, Master Gudo, Spirituality, Willingness, ZenLeave a comment on Make sure you live when you are still alive!